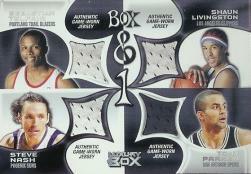 Topps is pleased to announce an all-new Basketball Card line that features the finest in premium quality trading cards and guarantees a thrilling pack opening experience - 2004-2005 TOPPS LUXURY BOX BASKETBALL. Until collectors open a pack (2 in one), they'll have no idea if they've been admitted to the TIER RESERVED, LOGE LEVEL, MAIN RESERVED or the ultimate LUXURY BOX. And just like in any NBA arena, the LUXURY BOX is a ticket to exclusivity. (5) TIER RESERVED packs - each pack includes 7 base cards and 1 Season Ticket Parallel Card. (2) LOGE LEVEL packs - each pack includes 7 base cards and 1 sequentially numbered SINGLE or DUAL Relic Card. (2) MAIN RESERVED packs - each pack includes 7 base cards and 1 sequentially numbered TRIPLE or QUAD Relic Card. (1) LUXURY BOX pack - includes 6 base cards, 1 Season Ticket Parallel and 1 sequentially numbered AUTOGRAPHED Card. And how's this for VARIETY. The 150-card base set includes 100 veterans, 30 short printed Rookies and 30 short printed legends and features 5 unique parallels - Season Ticket, Tier reserved (#'d to 300), Loge Level (#'d to 100), Main Reserved (#'d to 25) and Luxury Box (1 of 1). There are also AUTOGRAPHED parallels (Tier #'d to 75, Loge #'d to 30, Main # 'd to 10 and Luxury Box #'d 1 of 1) and RELICS (Tier #'d to 200, Loge #'d to 75, Main #'d to 30 and Luxury Box #'d 1 of 1). Four sequentially numbered Autograph Programs also shine in Luxury Box - Champagne Toast, Red Carpet, Red Carpet Legends and Signs of Luxury. Stars such as Shaq, Tim Duncan, Ben Wallace, Jason Kidd, Tracy McGrady, Amare Stoudemire and Carmelo Anthony all grace these sets with their signatures. And for Relics, it does not get any better. The sequentially numbered Lay-Up, Assist (Double Relics), 3-Point Play (Triple Relics), Triple Threat (Triple Relics) and Box & 1 (Quad Relics) all feature the best of the best-Shaq, Melo, Yao, T-Mac, Duncan, KG, Okafor, Dwight Howard, Jason Kidd, Shaq. You name it, and he's in the product. The Relic programs also feature a very limited number of Autographed versions. Each 10-pack box of 04-05 Luxury Box caries a $100 SRP and guarantees FIVE Sequentially Numbered Parallels, FOUR Relic Cards and 1 Autographed Card and is set to release the second week of March.